Because I had so much fun writing for Diabetes Blog Week this past week, I figured I would continue the fun by writing on the wildcard topics during the next couple of days. This topic is very interesting and I believe that this pretty much covers my fantasy diabetes device. And hopefully within the next couple of years this will move from fantasy to the realm of reality. The artificial pancreas will be a huge break through for the Diabetics of the world. The artificial pancreas will essentially automate the blood sugar testing and insulin administering, and pretty much take the place of all pumps and CGM’s. I cannot wait for this innovation and also cannot wait to see where science/technology takes Diabetes. This entry was tagged Artificial pancreas, Blood sugar, Conditions and Diseases, DBlogWeek, Diabetes, Diabetes Blog Week, Diabetes management, Diabetes mellitus, Diabetes Online Community, DOC, Insulin, Pancreas. Bookmark the permalink. Yup, I’m looking forward to the Artificial Pancreas too!! 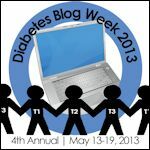 Super glad you jumped in and participated in dBlog week, Paul! Was fun getting to know you a bit!